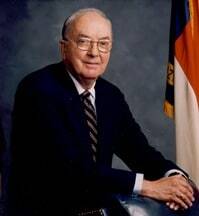 Jesse Alexander Helms, a five-term Republican Senator (1973- 2003) from North Carolina, was known not only for his conservative beliefs but for the lengths he would go in support of them. A proponent of the conservative resurgence movement in the 1970s, Helms cherished his nickname: “Senator No,” granted for his obstructionist tendencies. 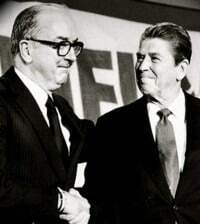 As a member and later chairman of the Senate Foreign Relations Committee, Helms demanded a staunchly anti-communist, anti-leftist foreign policy. He took a special interest in Latin American affairs. To that end, he obstructed the appointment of dozens of State Department appointments over his three decades in the Senate. Helms’ staff shared their boss’ conservatism and could be as tough to deal with as the Senator himself. Many of the former diplomats quoted here had their nominations obstructed by Senator Helms; all but Viets were eventually confirmed. Charles Stuart Kennedy interviewed Sherman M. Funk in July 1994; Richard N. Viets in April 1990; Otto Reich in August 1991; Chester Arthur Crocker in June, 2006; Bruce Gregory in January, 2006; Richard Fairbanks in April 1989, and Frank Ruddy in September, 1991. Ann Morlin interviewed Melissa Wells in March, 1984, and J.Edgar Williams interviewed Jeannette Wallace Hyde in September 2007. Read how Senator Helms believed the shoot-down of KAL 007 was meant to target him and his visit to Pinochet’s Chile after the death of an American citizen. Follow the links to read more about Congressional relations with the State Department. FUNK: A Senator from North Carolina and very right wing Republican. A courtly gentleman. People who hear of him only in a negative sense are always startled when they meet him because he can be very gentle; he can be very sweet in a way, which is strange to say about a man like Jesse Helms. My son was in the service then. 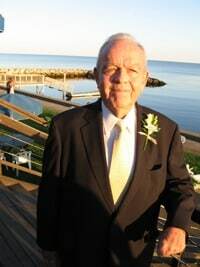 And [Helms] made a point of asking [my son] Chuck’s children and the wife to come forward to meet him, and he complimented me on having such wonderful children. It’s very disarming. The fact is he has a deep-rooted suspicion of the State Department. In his political thinking he’s quite narrow, very powerful, and he plays the rules of order of the Senate like a master. He knows exactly how far he can go, and he’s had the State Department intimidated because he single-handedly stopped more ambassadorial appointments than anybody else in the Senate by far. And sometimes he’s kept them on the limb on a string twisting for months and months and months. Melissa Wells probably comes first to mind, who for almost seven months was kept twisting because Helms simply didn’t like her position on the right-wing group in Mozambique. And I found to my delight that Melissa Wells was so strong she was able to work at trying to arrive at some kind of modus vivendi, not because she was afraid of Jesse Helms, but because she thought it was right. And I was afraid she would have been intimidated by Helms. Anyway, Helms was my supporter, not because of anything about me, except he had heard good things about me, he heard I was tough. He heard I was fair, but he heard I was tough. I had never met him before I went around to my preliminary confirmation hearings. His staff had been in touch with me. My reputation at [the Department of] Commerce had apparently come to his attention, and when the Act passed in 1986 he was told I was the one the White House wanted to move over to State. Apparently liked what he heard about me. I don’t know that. All he told me was that he thought I would be a wonderful IG [Inspector General]. And Senator [Claiborne] Pell told me, “I’ve heard good things about you from Jesse.” I only met with him about maybe three or four times in my total life. It was a report of a covert program which I reviewed at his request and Senator Dodd’s request, and they both disagreed with it for totally different reasons. But he became not just an opponent of mine, but such a strong opponent he introduced legislation to get rid of me. The only time it has ever happened in the case of an IG. It didn’t pass. Children were being named after me! The first little Melissa was born the day that the Senate voted. The next Melissa was born the day that I presented credentials. I kept getting pictures about little Melissas up and down Mozambique. I know of about four. All I was doing was upholding the administration’s policy; I was not doing anything else, but it turned me into a heroine and opened doors for me that–well, I have a lot of confidence; I think I would have opened them eventually, anyway, but, boy, did I get off to a running start! Now, please, please make it absolutely clear that I don’t want to recommend this for any other ambassador, and once is more than enough. Richard Viets, Appointed as Ambassador to Portugal in 1987. Helms’ obstruction led Viets to retire. VIETS: I said yes the next day to the Secretary [of State George Shultz] and my name was soon thereafter sent up in nomination [to become ambassador to Portugal.] I started studying Portuguese and getting ready. 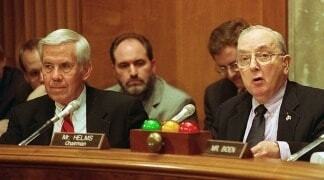 And then Senator Jesse Helms entered my life. For one solid year he put a hold on my nomination. I think I am in the Guinness Book of Records. I was voted out of the Senate Foreign Relations Committee to the floor three separate times by huge margins. Each time my name got to the floor Senator Helms put a hold on it. The essence of the Helms position, I think…firstly, he was really manipulated by a member of his staff who had been in the Foreign Service and who either was selected out or got out one step ahead of the sheriff. I have never known. I did not know him in the Foreign Service. But this man had only one mission in life and that was to do whatever he could to skewer the Foreign Service whether it was in appropriation bills, or hearings on ambassadorial nominees, or what have you. I think I represented for this staffer a great many things that he did not like about the Foreign Service. Everything from the way I spoke, to the school I went to, to the fact that I had been very, very lucky and risen very rapidly in the ranks, etc. He developed for Helms’ use a most extraordinary series of charges which were based in every instance on issues that, fortunately, I was able to disprove. But in the process an awful lot of dirty linen got washed around town. There was a lot of unpleasantness and humiliation and it is a chapter of my life that I have closed forever. I should add for the record because I think it answers better than anything I can say about how the system works: towards the end of the year of being “held” by Helms, I went to the White House to see Frank Carlucci, who at that time was the President’s National Security Advisor. Frank was an old friend and colleague. He had been in Lisbon and spent a lot of time briefing me on the Portuguese and he had introduced me to a lot of his Portuguese friends. He was very anxious that I get to Portugal. He let me know that he would like to talk to me about trying to break the Helms hold, so I went over to see him in his corner office there in the White House. After our talk he walked over and picked up his telephone and called Helms. He told him that I was sitting there in his office and we had had a good talk and he really felt that enough was enough and Helms should lift his hold, and he gave him some reasons why. Helms just very curtly said, “I am not going to,” and hung up. Frank turned to me and told me what Helms had said and said, “I guess that is it. We, unfortunately, need Helms more than we need you.” It was said in a very nice way and I didn’t blink at all. I understood it very clearly. At this level in this world and in this type of game there are those who are expendable, and I clearly was one who was. Helms surely had a price and Frank knew that. 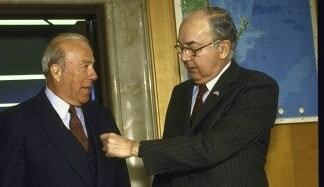 George Shultz knew that. The President knew that. But nobody was prepared to pay his price. 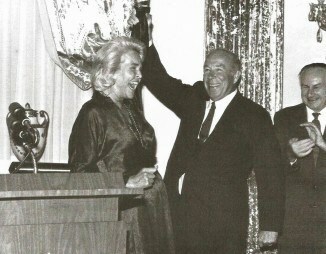 REICH: Senator Jesse Helms, who always philosophically opposed the land reform program [in Venezuela] and still does, held up my nomination for quite a while, to the point where Senator Richard Lugar (seen at right with Helms), who was then the Chairman of the Foreign Relations Committee, had to intervene at the request of the White House. I had known Senator Lugar; we had worked together on a number of things. He held hearings on my nomination over the objections of Senator Helms. That was the only reason I became an Ambassador. I had many dealings with him and his staff. First, to be confirmed as Assistant Administrator for AID [U.S. Agency for International Development] I had to go before his committee. He tried to block my nomination as Assistant Administrator for AID because when I was the Washington Director of the Council of the Americas, from ’77 to ’81; the Council of the Americas had supported the Panama Canal Treaties. I told you I had served in the army in Panama and I knew the United States could defend its interests in a Panama Canal while giving back to Panama the 500 square miles of territory and the sovereignty that it controlled. I had read a lot of historical documents; I read books while I was in Panama about its history. In fact, the treaty that ceded this land to the United States said that the United States had these rights “as if it were sovereign.” That was when I was in charge of the Washington office of the Council of the Americas…The Council, as I said, was probably the most conservative organization that supported the Panama Canal Treaties. In the view of other conservatives, that made it a leftist organization, which of course is laughable. But the Council supported the Panama Canal Treaties for the same reason that I personally had supported them, which is that I felt the United States could defend its legitimate interests in the operation of the Canal, maintain the Canal open, operational and neutral — which was a bit of a catch phrase at the time — and have good relations with Panama and the rest of Latin America. Latin America really did support Panama’s claim to this territory. And frankly in retrospect, here we are in 1991, 14 years after the signing of the treaty, and I think our interests are very much protected and our relations with Latin America have never been better. Not just because of that, but I think it helped. 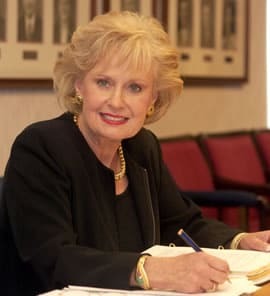 So, Jesse Helms tried to block my nomination, frankly caused me a great deal of difficulty, to the point where I went to Peter McPherson, who was then the Administrator of AID and offered to resign. I had been brought in as a Special Assistant to McPherson while the nomination process was going through the clearance process. McPherson refused. He was very principled and decided this opposition to me was not only wrong but unfair. When I was nominated, there was a real campaign against me. They said I was too liberal because of the Panama Canal position and because I had also been in the Democratic Party…remember I had been a Democrat and had worked in the 1972 campaign. [I found his staff to be very zealous] and, by the way, very intelligent and very dedicated people, but philosophically totally opposed to some of the things that the Reagan Administration was doing. We used to drive them crazy. I would come to the hearings with quotations from Ronald Reagan on these subjects, to prove it wasn’t Otto Reich dictating policy. Later on in my hearings for ambassador, I reminded Senator Helms that on January 3, 1981 when he was still President-elect Reagan, 17 days before his swearing in, Ronald Reagan said that he would support the land reform in El Salvador. It was true, and it would drive the Helms people crazy because they were trying to show that here was the government run amuck. In fairness to Senator Helms, let me say for the record, the Administration did not do a good job of answering some of his real concerns about the land reform. I have to say that it was not until my nomination as Ambassador to Venezuela that some of these questions were answered. Because when he held up the nomination, and after Senator Lugar held hearings on me, Helms came to the hearings and asked a lot of questions, which he has the right to do, and then gave me a set of written questions, which is one of his ploys, by the way. In my case it was a small number of questions, not like he asked other people. But they were good questions, and they had not been answered. Frankly, I was in a bit of a shock to find out that these questions from Helms had not been answered, by either my Bureau when I was Assistant Administrator, by my successors or by the State Department. So I asked McPherson, who was still Administrator, to give me a couple of people to go through the files and find the records to show how we had supported land reform in the free market way that Helms felt the US should support. Helms thought we had supported a collectivist program. What we had supported was the “land to the tiller” program, with titles to the land. 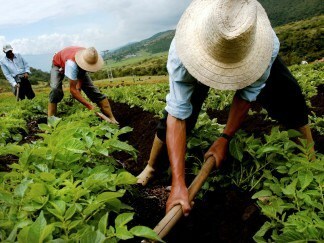 The peasants were to be the owners of the land, not the state, and not a collective. That seemed to satisfy Helms, when he saw that we had worked hard in 1981, and ’82 and ’83, and successfully, to make this a free market and a democratic land reform, not a socialist land reform. Helms was absolutely right as a US Senator to exercise oversight over these programs. It had been our mistake, perhaps based on arrogance and exaggerated views of executive privilege, to deny him the information. I answered it a little more articulately than that, but he accepted that answer. I was being truthful. I discussed land reform every time the subject came up. We also discussed a lot of other things. We weren’t obsessed with land reform in El Salvador, but that was the object of his questions. We had, unfortunately, to deal with many other crises at the time. Helms’ crew was doing everything they could to undercut or harass me, trying to figure out how to get me to ether resign or to accept a deputy that they would nominate. They had in mind an individual in particular who had been associated with them in some way and who I think had been associated with the South African government. I went up for my confirmation hearing. The hearing went okay, but it was very amusing and I’ll never forget it, if you could imagine, I only had the one day of hearings, but then this was followed up with 108 questions from the Helms staff that were sent to the Africa bureau, 108 questions! And just the wording of the questions told you where the question was coming from. Things like, “Do you believe that the South African government should ever have to negotiate its future with black opposition groups that are wedded to violence?” or language like that. Or “Do you think that the Soviet Union is seeking to control the Cape sea route?” Very leading questions like this and some of them could only have been written in Pretoria. You knew that they were plants, in effect. So here we were, the American government at work and at play being manipulated by foreign interests who knew how to insinuate themselves into our system and exploit our readily apparent differences. What else is new? It happens in other parts of the world. It certainly happened in this part of the world. But during my day of hearings I was welcomed by Senator Helms. Chuck Percy was the chair. So Percy was very, very diplomatic and polite and congenial, welcomed me. And then when it came Helms’ turn, he said, “Now Mr. Crocker, I’m sure your dog wags his tail when you go home at night. That’s not my question. My question is, are you going to support the president’s policies?” And then Paul Tsongas and Chris Dodd and a couple of others spoke, and Tsongas joked “Mr. Crocker, I kind of like some of your writings, but would it help you if I voted for you or against you?” So already I was being typed as someone that some Democrats could support, but some conservative Republicans had issues with me. 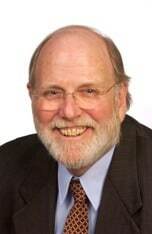 The Commission’s Republican Chairmen Ed Feulner and Tom Korologos had a good working relationship with him. Helms was a strong supporter of USIA’s information programs and international broadcasting. He was an outspoken advocate of the Voice of America’s policy editorials, which were not popular with Voice Of America’s news broadcasters. Just as newspapers have their editorial pages, Helms argued, the U.S. government should have its editorials. He was much less enthusiastic about educational and cultural exchanges. 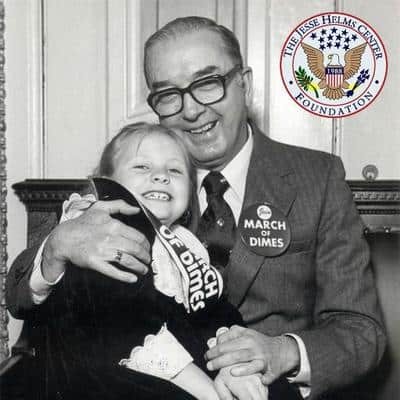 When the Cold War was over, Helms, as the powerful Chairman of the Senate Foreign Relations Committee, led a campaign to eliminate the three foreign affairs agencies – USAID, ACDA, and USIA – arguing it was necessary to cut costs and reduce the size of government. His primary targets were USAID and ACDA. He was not opposed to an independent USIA, but the Agency got swept up in his larger argument about the need to eliminate government agencies. When these issues were debated in the first Clinton Administration, Vice President Al Gore and Elaine Kamarck, one of his senior staff advisors, led a vigorous campaign to maintain the independence of the three agencies. In letters to Congress, they argued their merger with State was unwise organizationally and would not save money. The Advisory Commission was deeply involved in this discourse and supported USIA’s independence. In 1996, however, the politics changed. Incoming Secretary of State Madeleine Albright wanted to have a good working relationship with Senator Helms as Chairman of the Foreign Relations Committee more than preservation of the three agencies. As President Clinton confirmed in his recent memoir, My Life, the administration needed the Committee’s support for its Chemical Weapons treaty. The reorganization of USAID, ACDA, and USIA was part of the deal. 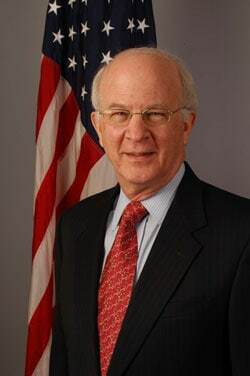 In 1997, Commission Chairman Lewis Manilow, Commissioner Walter Roberts and I met with then-Under Secretary of State for Political Affairs Thomas Pickering, the Secretary’s senior career advisor on the reorganization. He had proposed as a governing principle that all of State’s existing Under Secretaries and new Under Secretaries for the incoming agencies would act as a “Corporate Board” for the Department. He explained they would make strategic planning recommendations, but decision-making authority and resource management would be “pushed down” to the Assistant Secretaries. The Under Secretaries would have a “tie-breaking” role in major disputes, but real budget and personnel power would rest with the nearly autonomous Assistant Secretaries, especially those responsible for the Department’s regional bureaus. State adopted Pickering’s “Corporate Board” model. When the dust settled in 1999, USAID had effectively fought to remain semiautonomous. ACDA preserved its organizational coherence within State. USIA’s activities were decentralized throughout the Department. Most authority and funding for the Agency’s field programs went to the regional Assistant Secretaries who reported to the Under Secretary for Political Affairs. FAIRBANKS: He had a couple of motivations. One was that he felt very strongly about the kind of policies that he had hoped and expected the Reagan Administration would follow. He had been a very early supporter of Ronald Reagan to be President of the United States; he felt that he was comfortable with those policies and understood them. He wanted to make sure that, from his point of view, the kind of people who would follow the policies he expected went into the right jobs. He felt that he had a role to play to make sure that the Reagan team was the right team. Also, he has a very strong feeling about the role of the Senate. He takes “advise and consent” seriously and would try to extract agreements and promises from nominees that they would follow a particular course of action. He is a very active, involved, articulate defender of his views. He played a very strong role. The Senate was run by Republicans; the Foreign Relations Committee had a Republican majority; the chairman was Charles Percy of Illinois. We were representatives of the Executive Branch. The President had his policies and his personnel choices. These were Ronald Reagan nominees that we trying to get confirmed. Therefore we would take the position that we wanted to hear what the Senator had to say; we respected the Senate as a co-equal branch of the government which had a responsibility under the Constitution for confirmation, but on the other hand, we didn’t back down or kowtow because certainly Al Haig and Ronald Reagan were people who knew their own minds. If they wanted something done in their Administration in a particular way and wanted particular people to do it, they expected to get those people confirmed. It was a process of listening and sticking to our objectives. We didn’t drop any nominees. We didn’t change our minds about any. We had only one nominee who didn’t get confirmed out of the entire list, and that was Ernest Lefever, the initial nominee for Assistant Secretary for Human Rights. Actually he withdrew, so we never really lost one. There were some close ones, however. Bill Clark who was the initial Deputy Secretary of State, had a fairly close vote in the Foreign Relations Committee on partisan lines. But finally, everybody did get confirmed. Senator Helms was in a tough race that year, and the purpose of the ad was to show that a large number of U.S. ambassadors supported him, and by implication, his views on U.S. foreign policy. As political appointees, we were not covered by the Hatch Act [which prohibits most Executive Branch Employees from partisan political work] and could legally endorse a candidate without violating any law. I said I would be happy to go on record supporting the Senator for two very simple reasons: I agreed with him on most things, and, on a personal level, when I needed his help in my battles with McPherson, Helms had been there. He didn’t hesitate or give me any of “on the one hand…” business. He just delivered. So when he needed my help I said, “Absolutely.” The ad ran in all the major 30 papers, at least all the major East Coast papers. The ad itself and the participation of U.S. ambassadors in it were roundly criticized by the usual suspects, The New York Times and The Washington Post, and surprisingly by The Washington Times, a conservative paper. It turned out that Bill Cheshire, a deputy editor of The Washington Times, had played a major role in Helms’ ’78 campaign, but had had a falling out with Jesse. The Washington Times’ criticism of the Helms ad was payback time. After all I had been through in the previous four years, the flap over the Helms ad was small potatoes. I even thought of it as a badge of honor. I was pleased. There were about 23 of us ambassadorial types, I think, who signed the ad. I liked Helms then and I like him now. He is a decent man who has been terribly maligned. I think there are few in Washington strong enough to stand up to the abuse he has taken. With all the jokes about members of Congress who will take any position to be re-elected, Helms stands out among U.S. senators like the Rock of Gibraltar. Well, I needed Senator Helms’ support and we both were from Raleigh and we both went to the same church; we lived in the same neighborhood, but we really did not know each other. We had nodded to each other at church or we had nodded to each other in some public forum, but did not know each other personally. 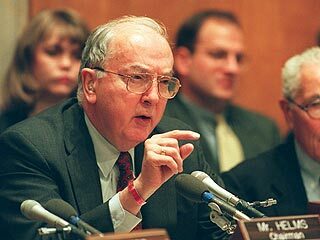 So as I am going through preparing for the confirmation, working with the State Department, the person at the State Department tells me that they need to make an arrangement for me to meet with Senator Jesse Helms, and that they will accompany me to this meeting. And I said, you know, I am sorry but I have to go alone to that meeting. I said this is my cross to bear and he is my U.S. Senator and I really need to call on him alone. Well, they were not happy with that, but they did finally agree that I could make the appointment and I could call on Jesse Helms in his office, which I did, and I have never been more nervous in my life. It was more than nervous; I was frightened. I thought here he knows that I have raised money against him when he was running for reelection, that I have always supported his opponents and now here I am calling on him to ask him for his support. I did not know what could happen, what kind of reception I would receive. I remember when I arrived by taxi to his Senate office building I literally was, I think, shaking, I was so nervous. I went in, introduced myself to his receptionist and the receptionist said indeed, Senator Helms is expecting you and led me into his office. Well, the moment I entered his office Senator Helms rose from his chair, I went across the room and put my hand out to greet him and it was like magic; we were like two long lost friends, we were like long lost cousins. It was just an instant identifying with each other. We had mutual friends, but we just did not know each other. He invited me to sit down. We sat and we talked and talked; we talked, we laughed, we joked at how he was on one side of issues and I was on the other side; how he was Republican and I was a Democrat; how we both lived in Raleigh and both went to the same church and had mutual friends but it was just a wonderful conversation, very warm, very humorous; he could not have been more delightful and the reception could not have been better. So we went, we took the little trolley to the Senate dining room. Senator Helms took me by the hand and introduced me to every Republican senator in that room. He told each and every Republican senator this is my ambassador, this is my North Carolina ambassador and I want you to support her. Well, I have never felt more humble in my entire life. It was touching, I was honored, and I felt undeserving but I was very much appreciative of Senator Helms.